Landwind X7: Sales add insult to injury. Land Rover is having no luck quashing the brazen -- and successful -- Chinese copy of its Range Rover Evoque, Jaguar Land Rover CEO Ralf Speth said at the Shanghai auto show last week. Landwind, owned by Jiangling Motors, was flaunting its almost millimeter-identical X7 with a display of four of them dominating its show stand. In a separate hall in the vast National Exhibition and Convention Center, Speth was clearly annoyed about the continuing existence of the vehicle, which was revealed in 2014. Asked whether JLR had made any progress in persuading the Chinese authorities to clamp down on Jiangling, he replied: "No. Not at all." He said he would continue to fight to have the X7 made illegal. 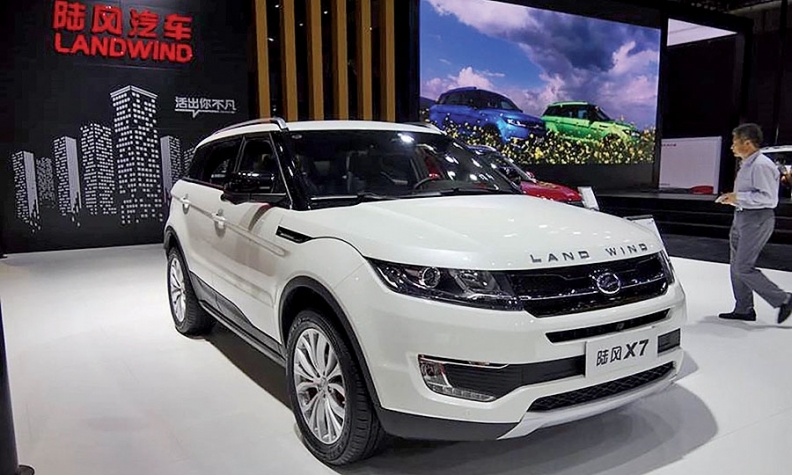 Land Rover's case was made harder last year when Chinese authorities abruptly canceled Land Rover's patent on the Evoque, which it builds in China as well as the U.K. JLR responded by opening a separate proceeding against Jiangling. Riling Speth is the fact that Landwind clearly does very well with the X7, which costs a third of the Evoque's price. Landwind is unusual in that it doesn't split out models in sales figures submitted to the China Association of Automobile Manufacturers. But the X7 accounts for the bulk of its 80,002 sales last year, believes Matt Gasnier, owner of global sales aggregator Bestsellingcarsblog.com. Said Speth: "They're doing very well. It's a good car. We know; it's our car."